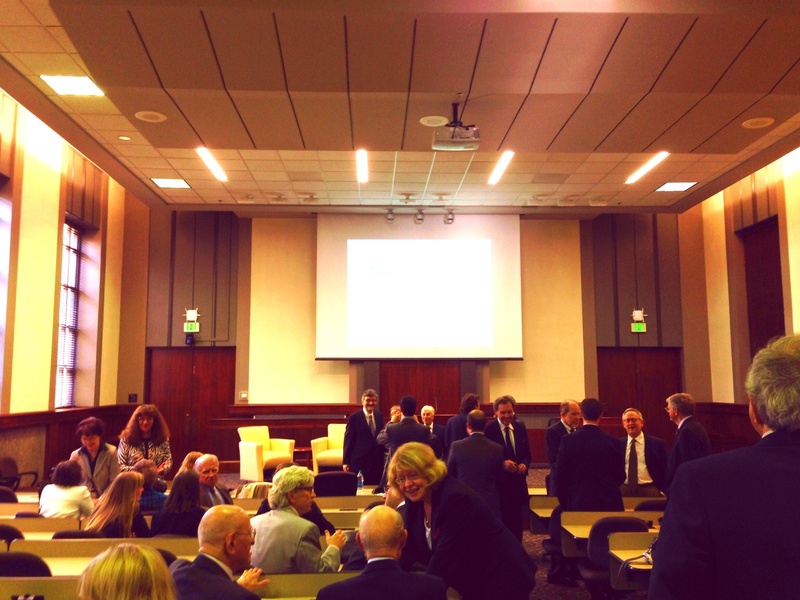 On April 10 and 11, I had the privilege of attending a conference organized by the CCLS entitled The Louisiana Civil Code Translation Project: Enhancing Visibility and Promoting the Civil Law in English. The conference, which brought together civil law scholars, translators, and jurilinguists from around the world, shed light on some recent translation projects and forthcoming publications that are sure to be of interest to law librarians, and explored the many issues surrounding the translation of law generally and with specific reference to the translation of civil law into English. Professor Olivier Moréteau, Director of the CCLS and holder of the Russell B. Long Eminent Scholars Academic Chair, kicked off the conference with a discussion of the Louisiana Civil Code Translation Project and the history of the Louisiana Civil Code’s various French and English iterations. Once published in both French and English out of deference to Louisiana’s bilingual culture, the Civil Code ceased being published in French after the end of the Civil War. Professor Moréteau explained that Louisiana has had a long history of creating its own unique “language” to express civil law concepts in English, and that the terminology can be quite close to that used in previous French language codes, both in Louisiana and in Europe. Over the past several years, the CCLS has worked on translating the code back into French, focusing on maintaining the unique tone of the Louisiana civil code and on demonstrating to French-speaking legal scholars that a civil code can indeed be written in English and made compatible with the common law while at the same time maintaining the distinct terminology and tone of the civil law tradition. Building upon these introductory themes, the conference speakers discussed a range of topics relating to legal translation, legal and linguistic equivalence, historical works of translation in the area of the civil law, and specific translation projects on which they have been working. The Hon. 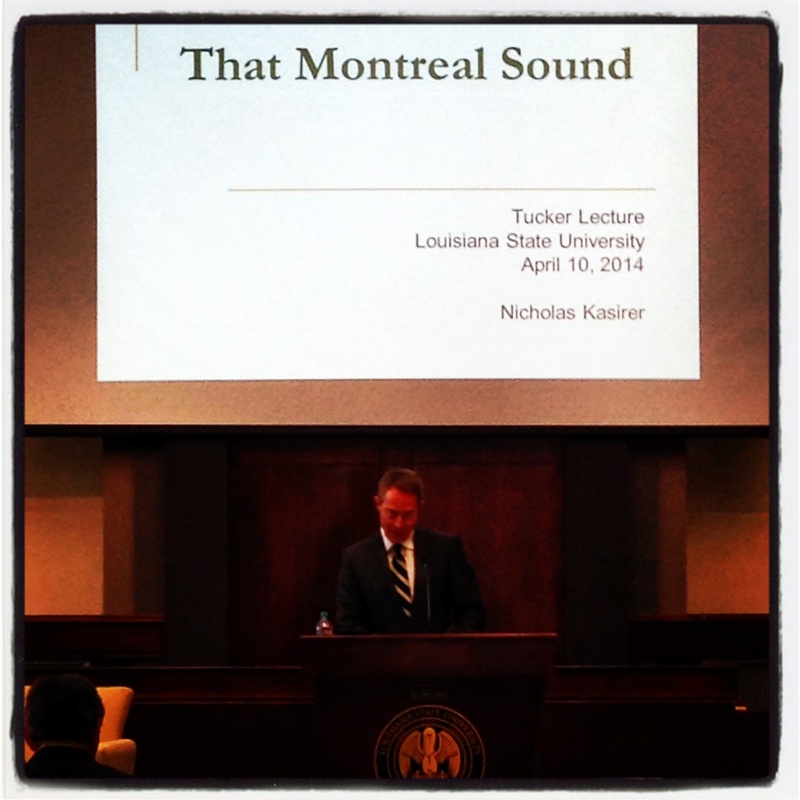 Nicholas Kasirer, of the Cour d’appel du Québec, delivered the annual Tucker Lecture, a keynote address entitled That Montreal Sound: The Influence of French Legal Ideas and the French Language on the Civil Law Expressed in English, during which he shared fascinating examples of the essential “Frenchness” of the English language Québec Civil Code. Agustin Parise, of Maastricht University, spoke on the first Spanish translation of the Louisiana Civil Code, and its influence on the civil codes of Latin America. Professors Alain Levasseur and John Randall Trahan of LSU, and Professor David Gruning of Loyola University in New Orleans, discussed their work on a new translation of the French Civil Code into English for Legifrance, while Michel Séjean of the University of Southern Brittany discussed his English translation of the French Code de commerce, and Serban Vacarelu, also of Maastricht University, mentioned his work in coordinating a forthcoming English translation of the Romanian Civil Code. In nearly all of the talks, emphasis was placed on preserving the tone and terminology of the civil law without falling back on similar-sounding common law terminology, and on the difficulties in reconciling the differences in the drafting traditions of the common law system, whose scholarship exists primarily in English, and of the civil law systems of Europe and Latin America. 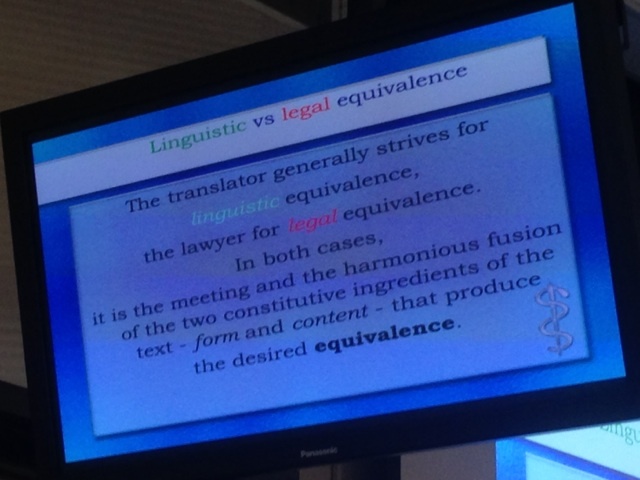 Perhaps the most fascinating portion of the conference, for me, was Professor Levasseur’s presentation of his experience in translating Gérard Cornu’s Vocabulaire juridique into English, with a specific focus on defining and translating those provisions most relevant to the Louisiana Civil Code. Having assisted Professor Levasseur with this project in my capacity as a librarian, I was excited to hear him discuss the final product and the approach that he had taken to the translation. Avoiding a word for word translation that might mislead readers accustomed to working exclusively in English or with common law concepts, Professor Levasseur decided to provide a descriptive explanation of the French term in English before providing suggested English terms (as well as terms to avoid.) In this way, the translation is constructed in a way that forces the reader to understand fully the nuance and meaning of the civil law term before choosing a word to express the concept English. The Vocabulaire juridique translation is now complete and will be available from LexisNexis in July 2014. Although a few of the lectures in this conference were admittedly a bit beyond my full understanding (both because they delved into the technical aspects of jurilinguistics, and because about half of them were delivered en Français), it was incredible to witness the group’s excitement and dedication to an area of study that is probably largely unfamiliar to most of us who have trained and are working in the United States legal profession. All of the presentations were recorded, and videos will be available on the CCLS website sometime during the next few weeks. In the meantime, those interested in the civil law tradition, and particularly in how it has developed in the Americas, should keep an eye on the CCLS website for further news about their very interesting work. 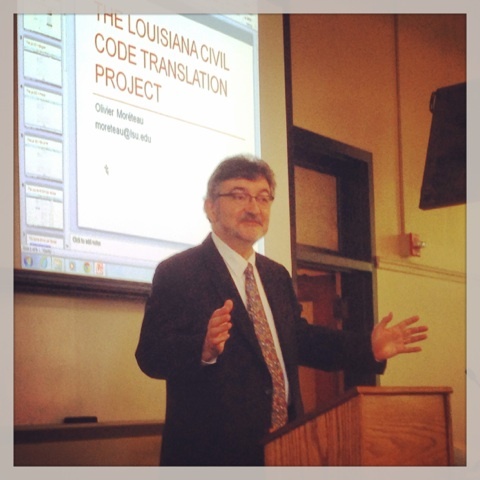 The Louisiana Civil Code translation is available on the LSU Law Center’s website, and individual segments are published in the Journal of Civil Law Studies on LSU’s Digital Commons as the translations are completed. The Preliminary Title, as well as sections on the Law of Obligations and Suretyship and Mandate, are complete and available from both sources.